Nature’s endless creativity coupled with human imagination often can be found on a simple map. One of such things is Finger Lakes in the New York state. West of Syracuse lies an ensemble of thin long lakes that resemble fingers of a hand. It is a beautiful place that can send you on a road trip through the towns and cities in the area. It is littered with waterfalls, gorges, and rocky cliffs. This region is also well known for its vineyards, with the Finger Lakes Wine Festival held in July. The lakes keep the temperature in the region cool with often rainfalls, so the high season is in summer when it is warmer and less likely to rain. The winter months are also beautiful but very cold. Comfort bus charters will gladly give you a tour of the lakes in any season. If you have never been to Finger Lakes and don’t know where to start, here is a one-day road trip plan that will take you to the two biggest lakes of the region, Seneca and Cayuga. Start at Watkins Glen State Park on the West side of Seneca Lake. One of the most popular local places will enarmor you with the astonishing scenery of the rocky cliffs and cascading waterfalls. There are trails for hiking and smaller lakes for trout fishing. Once you are satisfied with the views here, jump on the bus and go to the other side of the lake to watch Hector Falls. It is 165 ft high and part of the waterfall can be seen from the road. Of course, you can get the full picture only by flying over it, but if you have a drone, be sure to make some great footage. Your next stop is at Taughannock Falls State Park, west-side of Cayuga Lake. It is a 750-acre park with a 215 ft waterfall. You can spend hours exploring the trails or have a BBQ picnic and be on your way. It has beaches for swimming, fishing spots, paddle board and kayak rentals, and there is viewpoint overlooking the Taughannock Falls right near the visitors center. The park is also equipped for winter sports. 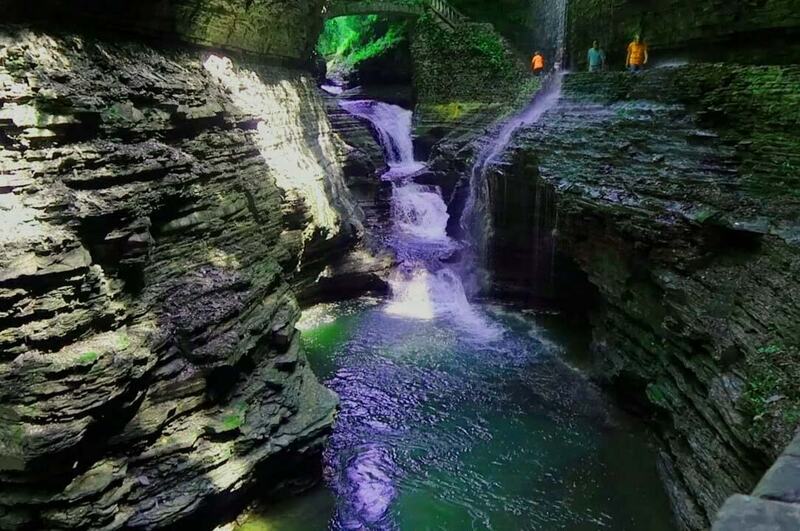 Now hop on the bus and continue your journey to the beautiful city of Ithaca, to the Buttermilk Falls State Park. This park’s waterfall takes its name from the foaming cascades formed by the Buttermilk Creek. Buttermilk Falls is not the only attraction of the park. If you want to truly experience it, take the Gorge Trail. It’s an easy 5-mile hike, but a nice way to get fresh air and clear your mind. Close off your trip with a visit to Robert H. Treman Park. Another gorgeous spot for hiking, swimming, fishing or even spending the night.